The apparel industry is one of the growing industry because of higher demand for garments items. Buyers always expect to get a quality product from the garment’s maker. So to ensure production and supply of quality product, every factory has their own quality control department. A quality control department is planned and controlled by a quality manager. As a garments maker or as a potential quality manager you must need to be aware of the job responsibilities of quality manager in apparel industry. Quality manager in the apparel industry is a person who manages quality control and assurance. He is responsible for developing quality controlling procedure for the whole factory and ensure required quality. It is a big responsibility to work as a quality manager, have to control quality issues and getting a quality product. Quality Manager is responsible for satisfying customers by providing a quality product. So for textile and garments factory, it is very important to have a post for a quality manager. 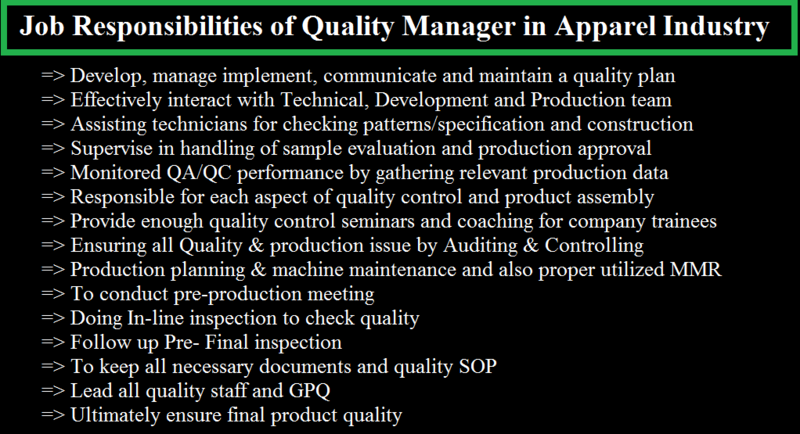 In this article, I am sharing a list of job responsibilities of Quality Manager (QC/QA) of an Apparel Industry. Develop, manage implement, communicate and maintain a quality plan to bring the Company’s Quality Assurance Systems and Policies into compliance with quality system requirements. Effectively interact with Technical, Development and Production team to maintain product quality; ensuring that targets are achieved. Assisting technicians with checking patterns/specification and construction, identifying and resolving production impracticalities in an appropriately timely manner, and to make a final decision on quality according to company standards and requirements. Supervise in the handling of sample evaluation and production approval by reviewing the measurement, workmanship, fitting, accessories, etc., and giving comments on production. Monitored QA/QC performance by gathering relevant production data and producing statistical reports to be communicated with all related departments. Identifying relevant quality-related training needs and delivering training. To provide approval such as print, embroidery, wash & as per required by the buying house. Tagged Capabilities of QC or QA Manager in Apparel Industry, Job Description of a Garments Quality Manager, Job Responsibilities of a Quality Manager in Apparel Industry, Job Responsibilities of Quality Manager in Apparel Industry, Job Responsibilities of Quality Manager in Apparel Industry pdf, Quality Assurance Manager in Garments, Quality Control Manager in Garments, Quality Control/Assurance Manager in Garments, Quality Manager in Apparel Industry, Responsibilities of a Quality Manager in Apparel Industry, Skills of Quality Manager in Apparel Industry.